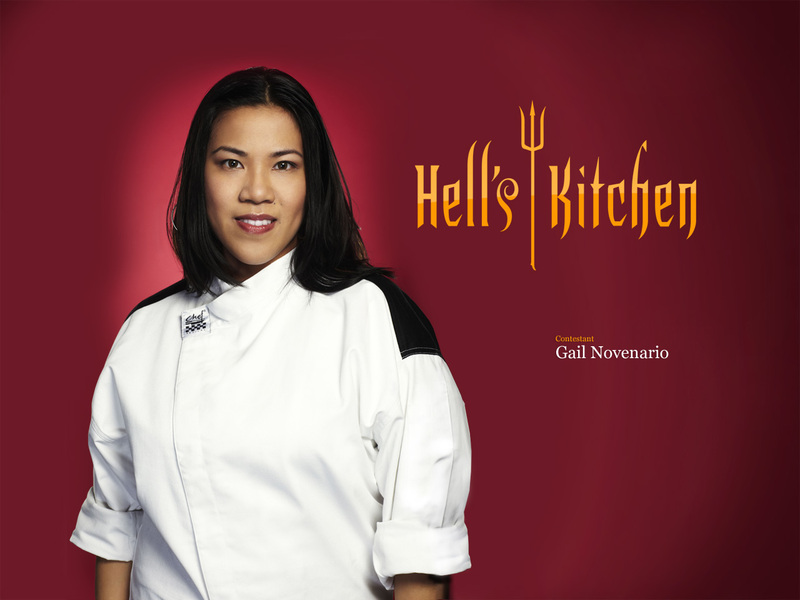 So it finally came down to Russell vs. Nona for all the marbles, and if you haven’t noticed, “Hell’s Kitchen” has regressed to the point that they don’t do the finale live anymore. But that’s okay….if they did, it would be two long and grueling hours. As it was, they started out with Nona and Russell being whisked off in a helicopter to the site of LA Market, where one of them would become head chef. But of course they would have a challenge, and that would be to whip up 5 courses in 45 minutes…say what? Really? There is no way I believe they did that. Anyway, Gordon Ramsay brought in some of his celebrity chef buddies and subordinates to judge each course. As always it came down to a tie after four rounds (has it ever not?) and for the meat course judged by executive chef at LA Market Kerri Simon, Russell won. So his prize? Once they arrived back at the dorm, they were surprised by eight of their former teammates being there. They would choose their teams, and Russell had the first pick. Initial challenge: Re-creating a dish that Ramsay created by tasting it. Initial challenge: Signature “power lunch” in food trucks. Mistakes: Menu items. Russell actually made grilled octopus salad. Really? Trev made spaghetti with sausage. Really? Out of a food truck? Winner: Gail, for her steak salad with mango and pecans. I thought Nona’s chicken salad sandwich with bacon and sweet potato chips would win, but that’s me and that was California. Russ’ dish was the least favorite…uh, big duh. Punishment: What else? Cleaning the food trucks. Dinner service: Nothing special, other than Paris Hilton being one of the guests. Mistakes: Lots of them. Jillian could not cook scallops or halibut properly, and Russell was helping. Nona didn’t cook pasta all the way through…..Trev tried to re-fire meat…then Ramsay and sous chef Scott walked out to cool off and make nice for the reality show cameras. When they returned, they switched all the stations up. 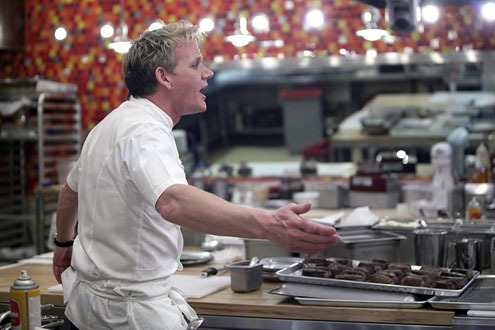 Then Gail served raw salmon, Jillian did not cook eggs all the way through and Ramsay followed through on his promise, telling Gail and Jillian to…. Winner: Nobody, and they had to come up with a consensus two nominees for elimination. On the block: Gail and Trev. Going home: Gail. At least she got a makeover, and that’s what she said on her way out the door. Meanwhile, how in the world is Trev still here? Thanks for reading and see you all next week! 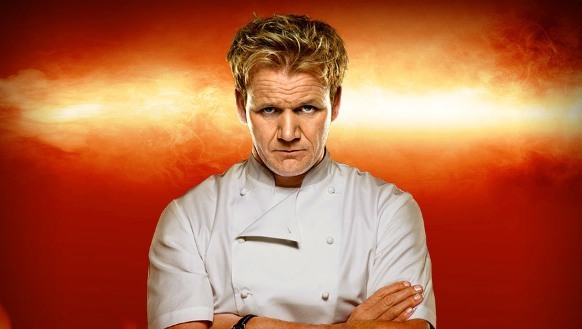 Thankfully, last night’s episode of “Hell’s Kitchen” on Fox was just one hour, or one episode instead of two lumped into one. They must have realized that if they kept doubling them up, the show would be over by Thanksgiving. Anyway, here is our recap of last night, and we’re now down to five chefs! Mistakes: Gail undercooked scallops; Trev overcooked pasta; Gail’s fish stuck to the pan; Jillian over-salted mashed potatoes; Gail “poached” her grilled salmon; Russ’ beef was raw in the middle. Ramsay pulled them all aside and said, “No more mistakes!” They straightened up for a bit before screwing up more. Russ’ steak was raw again, and that set Ramsay off. On the block: Trev and Sabrina. Sabrina started whining, though, about how she thought Gail screwed up more than she did and waah, waah, waah! Man, she’s annoying. Going home: Sabrina, because the producers have mercy on us. 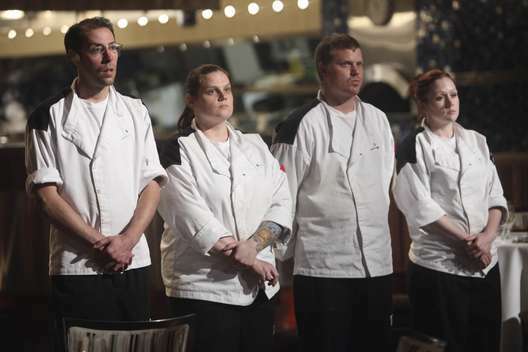 So that’s it, we’re down to the final five—Trev, Nona, Russ, Gail and Jillian. Does that seem to you like the weakest final five ever? You have to believe it’s Russ’ job to lose. But we’ll see what happens in the coming weeks. Thanks for reading!